EXCLUSIVE private guided tour of the amazing Space Shuttle Atlantis exhibit - this fantastic new exhibit showcases Atlantis as if it were in space - raised 30 feet off the ground and rotated 43 degrees - and also tells the compelling story of the entire shuttle program. More than 60 interactive, immersive exhibits and simulators provide a never-before experienced perspective on the shuttle’s complex systems, components and capabilities. 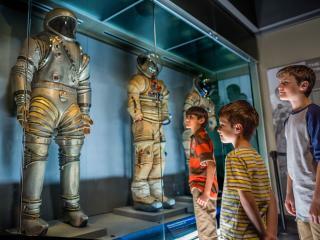 Take the NASA Bus tour with stops at the Saturn V exhibit area. See incredible 3D space films at the IMAX® cinema. Walk through the impressive Rocket Garden. Take a look at the full size Space Shuttle reproduction. Afterwards, head to the beautiful swamps of central Florida where you will enjoy an fascinating 30-minute Airboat Ride along the St. Johns River and across Lake Poinsett. See exotic birds, turtles and the Florida alligator in their natural environment before your pilot cranks up the speed and takes you on a thrilling rides through walls of tall grass at speeds of 45 miles an hour. The Kennedy Space Center and Airboat Safari Tour operates Thursdays and Tuesdays. The tour picks up from various central locations in Orlando between 7.15am and 8.30am and the return time to Orlando is around 7.00pm. Transfer time to Kennedy Space Center Visitors Complex is around 1.5 hours.